This peak in the northernmost part of the Pantheon Range is an easy hike to the top at 9250 feet. 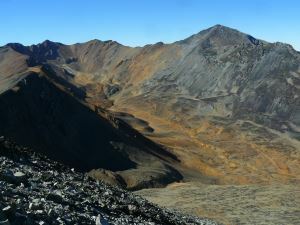 A mining road in decent 4x4 shape goes right past treeline and the peak is easily approached. The turn off is about halfway west of Tatla Lake, towards Miner Lake (marked on the 1-250 map). It's almost 30km off the highway to where you park on the peak. At the last fork on the road above treeline stay left and walk on the road into a lake basin of alpine tundra with the mellow pyramid of Perkins at the head. You can be on the summit in 2 hours from the truck if you motor. Views on the top are good - from the Monarch Icecap, Klinaklini Icefield, Pantheon, Waddington, and Niut Ranges. You can also see back forever into the flatness of the Chilcotin plateau.